JC Glass (Jones & Co) were British importers of Scandinavian + Bohemian glassware. Swedish blue cased glass 'hooped' vase with white internal casing, imported to UK by JC (Jones & Co), labelled. Made by Lindshammar. Ref: click here. Swedish red cased glass 'hooped' vase with white internal casing, imported to UK by JC (Jones & Co), labelled. Made by Lindshammar. Swedish blue cased glass 'hooped' vase with white internal casing, imported to UK by JC (Jones & Co), labelled. Made by Lindshammar. Swedish green glass vase, imported to UK by JC (Jones & Co), labelled. Swedish blue glass vase, imported to UK by JC (Jones & Co). Manufacturer unknown. Swedish amber glass 'hooped' vase, imported to UK by JC (Jones & Co). Manufacturer unknown. Swedish white cased glass 'hooped' vase, imported to UK by JC (Jones & Co). Made by Lindshammar. Ref: click here. Swedish blue cased glass 'hooped' vase with white internal casing, imported to UK by JC (Jones & Co), labelled. Made by Lindshammar. Swedish blue cased glass 'hooped' vase with white internal casing, imported to UK by JC (Jones & Co), labelled. Made by Lindshammar. Swedish blue cased glass 'hooped' vase with white internal casing, imported to UK by JC (Jones & Co), labelled. Made by Lindshammar. Swedish amber cased glass vase with white internal casing, imported to UK by JC (Jones & Co), labelled. Manufacturer unknown. Swedish amber glass vase, imported to UK by JC (Jones & Co). Manufacturer unknown. 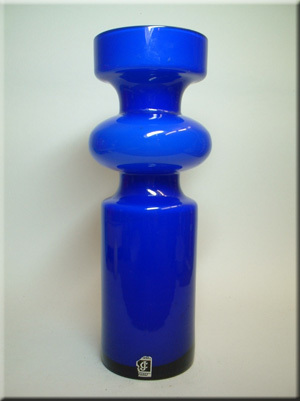 Swedish blue glass vase, imported to UK by JC (Jones & Co), made by Lindshammar, labelled. Swedish blue bark textured glass vase, imported to UK by JC (Jones & Co), labelled.